All rights reserved. No part of this may be reproduced in any form or by any means without the prior consent of the Author, excepting brief quotes used in reviews. A Free Web Novel. This story will always be distributed free. This story is a work of fanfiction. Names, characters, places, and incidents are the product of the author’s imagination or are used fictitiously. Any resemblance to actual persons, living or dead, events, or locales is entirely coincidental…unless you are a Dark Lord of the Sith. The contents of this novel have not been endorsed by Lucasfilm, Twentieth Century Fox, Disney, or any other entity affiliated with the Star Wars franchise. It is an unauthorized product of fan-fiction. To my husband Tim, for his loving support and for putting up with my absence as I consistently disappeared during the month of November to this story during NaNoWriMo 2015. Written for the enjoyment of all Star Wars fans everywhere. No matter how bad your day is at work, it’s always important to remember that you don’t work for a Sith Lord. With gratitude to George Lucas, without whom this amazing tale could not have been written. With gratitude to Cheeseburger Brown, for inspiring me to write this. A dedicated team of Star Wars enthusiasts who reviewed the novel for typos, canonical problems, and provided feedback and suggestions to strengthen the story. Tim B. | Anthony L. | Jonathan T. | Will H. | John C.
Years ago, I picked up Cheeseburger Brown’s The Darth Side: Memoirs of a Monster and fell in love with the story because I love all things Darth Vader. Seriously though, his unique story filled in the gaps with precision and humor. Last year (2015), I rediscovered his masterpiece and re-read it. Twice! During the second read—in October just before NaNoWriMo—I realized that no one had yet written the Emperor’s rebuttal to Vader’s journal. My mind spun into overdrive and I thought about different ways in which I might author a fun story that Star Wars fans could enjoy with the same enthusiasm I felt while reading The Darth Side. A few days later, I titled my idea The Darker Side and began writing project notes. A few days after that, I decided to use NaNoWriMo 2015 as the springboard to write the Emperor’s story—and I did it! 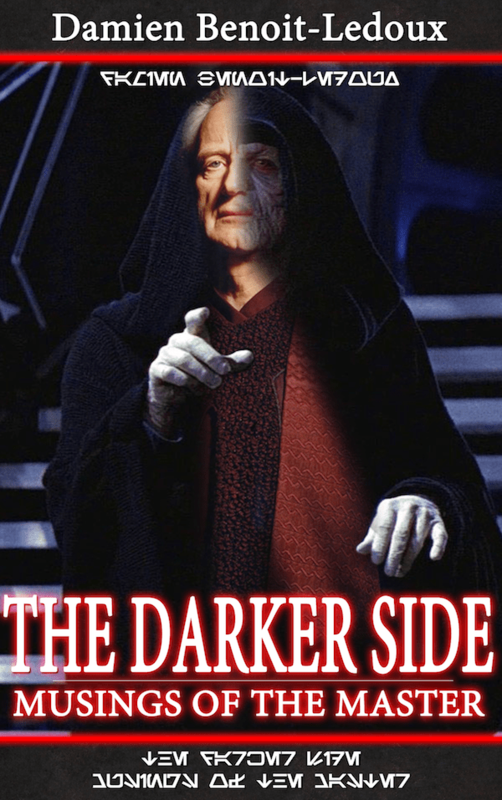 While you certainly don’t have to, you might want to read The Darth Side before you read The Darker Side since the latter responds to the former. Emperor Palpatine’s spies discovered Darth Vader’s personal journal hidden away in private databanks onboard his flagship Super Star Destroyer Executor. Quietly upset by Vader’s musings and distractions, the Emperor set out to journal his corrections to Vader’s successes and failures—and share the true purpose behind everything he did for the greater good of galactic peace. And so, to tell the Emperor’s story, I decided that I would go all the way back to the beginning and let the Emperor regale the citizens of the galaxy (I mean, you, the reader) with his masterful tale of securing galactic peace. I decided to represent Star Wars canon as faithfully as possible. Thus, I based the story largely in Star Wars canon as found in the six movies, the Clone Wars cartoons, and the canon-side of Wookiepedia. Occasionally, I dipped into the legends-side of Wookiepedia and carefully chose pieces that would serve the continuation of the story without delving into non-canon. Naturally, you will notice I infused a few of my own ideas and filled in the gaps as needed. This minimal creative license, I believe, adheres to the canon of Star Wars and echoes the style of Cheeseburger Brown. I am aware that the current trend is to limit the number of adjectives and adverbs in writing. (I have software that tells me whenever I get adverb-heavy!) However, in the movies, Palpatine and the upper class in general speak with a flourish (especially in episodes IV, V, and VI) and use embellished English. He also uses the superlative a lot, and so this style will be reflected in his memoirs. This novel embodies a personal journal and is not written like standard science fiction. I decided that, since there is no evidence to support it, Sidious is not a writer by nature. First and foremost, he is an ambitious Sith Lord who is consumed with the Sith Imperative (the Grand Plan) and his efforts to succeed with it. As such, he does not overly describe his surroundings or relish in small details unless it affects him. Rather, he provides enough detail to educate the reader about what he wants you to know. Sidious expects that you know the galaxy’s general history and he wants you to know how wonderful his role has been in that history. Occasionally, he will provide details that he feels will help you understand the glorious actions he took to accomplish the Grand Plan.